In lack of other things I'm posting something not so new. I wanted to see Near make a stupid face so I had Mello pull his hair! Thanks [link] for screen tone! Anyway, the expressions are just awesome; so characteristic of the two in this kind of situation. lol, near looks alot older in this picture, but no matter how old mello looks, he will always have the additude of a child. Hahaha! I can perfectly see this happening!
. . . nice Mello. i totally love near's face! i love it it it it it!! i love near to death! HAIR PULLING thats how my friend gets me to cooperate!!!!! and it hurts! thats so funny and CUTE! 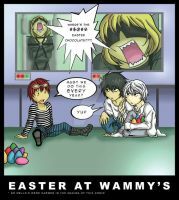 lol this is my fave mello and near picture EVER horray for mello you pull his hair mello! i love mello and near meh he's pretty cool i guess not a big fan of near. this is awesome , i like the colouring. That is like the funniest near reaction evah!! instant fav!! LOL: "I wanted to see Near make a stupid face so I had Mello pull his hair!" Hahahahaha them two crack me up! LOL Near's face is priceless! Near's facial expression is too perfect for words!